Grain and veggie bowls have become increasingly popular. I really enjoy having so many different fun textures in one bowl. It’s also a super easy meal with all the veggies grains and proteins in one dish. I love roasted veggies because of the sweetness that comes out of the veggies once roasted and I am also an avid sausage lover. For these bowls I actually used kielbasa, a garlicky thick type of a cured sausage you might call it. I used Meal Mart kielbasa but I’m sure any variety of the Meal Mart sausages will work. I wanted my kids to eat it and I figured kielbasa is also the closest to a “hot dog” which my little three-year-old cannot get enough of. 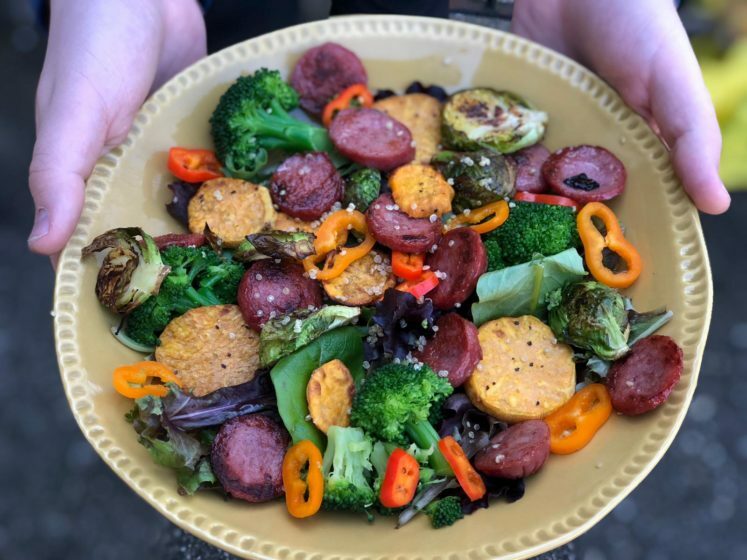 I taste tested this veggie sausage bowl on my 16-year-old too. I know it’s a winner because if both my 3-year-old and 16-year-old can eat the same dish then we have success! Place veggies on separate sheet pans lined with Parchment and sprayed with baking spray, making sure not to overcrowd the veggies. Drizzle 1 tbsp olive oil and sprinkle salt and pepper per each variety of veggies. Roast the veggies for 15-20 minutes flipping the veggies in the middle so they don’t burn and until the veggies are cooked through and are nicely caramelized (depending on your oven you may need to roast in batches). While veggies are cooking take your sliced kielbasa and place in a dry sauté pan on high heat and sauté the kielbasas about 1-2 minutes per side until cooked through and browned. Then set aside. To assemble the bowls place a large handful of mixed greens on the bottom of a bowl. Top the greens with about ¼ cup quinoa and load up the veggies, you can also add in your favorite fresh veggies such as peppers and cucumber for added crunch. Whisk all Ingredients together until uniform.